Ruth Stiles Gannett (born 1923) is an American children's writer best known for her imaginative dragon trilogy. 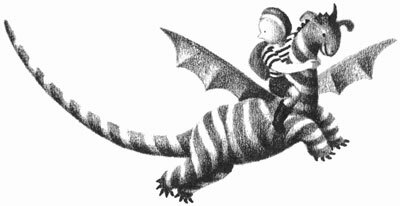 The first title, My Father's Dragon, was published in 1948, and followed by Elmer and the Dragon (1950) and The Dragons of Blueland (1951). The books were a family affair: her stepmother Ruth Chrisman Gannett illustrated the dragon books, and her husband H. Peter Kahn -- a professional calligrapher -- designed the typography. We imagine that Gannet's seven daughters and eight grandchildren had a special experience reading the "family book."